Geothermal experienced steady growth hampered by low fossil fuel prices and high development risk. About 315 MW of new geothermal power capacity came online in 2015, bringing the global total to 13.2 GW. Geothermal power generated an estimated 75 terawatt-hours (TWh) during the year. Low fossil fuel prices, coupled with perpetually high project development risk, created unfavorable conditions for geothermal power. Turkey led the market, commanding about half of new global capacity additions. Geothermal direct use amounted to an estimated 272 petajoules (75 TWh) of heat energy in 2015. 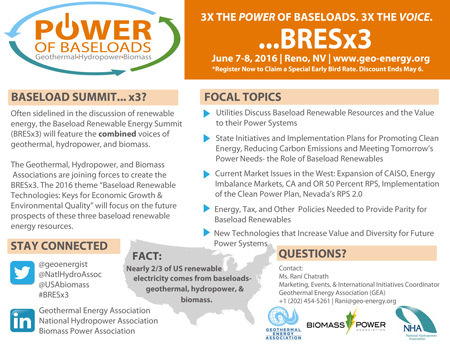 An estimated 1.2 GWth was added in 2015 for a total capacity of 21.7 GWth. The average annualized growth rate in direct use geothermal heat consumption has been a little over 3% in recent years. With a grant program, Armenia will commence geothermal exploratory drilling in the current year. Deputy Minister of Energy and Natural Resources Hayk Harutyunyan stated the above-said during his report at Monday’s joint session of the National Assembly committees, and regarding the “performance” of the 2015 State Budget of Armenia. As per Harutyunyan, the drilling will check for underground hot water resources in southern Armenia; and if the results are positive, a geothermal power station is planned to be built on location. Kenya Electricity Generating Company (KenGen) is seeking to extend its successful partnership with the Chinese firm, Great Wall Drilling Company, KenGen said Monday. KenGen Managing Director Albert Mugo told Xinhua in Nairobi that the Chinese firm has been its main geothermal steam drilling contractor. "We may approach the Great Wall Drilling Company so that we extend our current partnership due to their high efficiency in drilling for geothermal steam," Mugo said. Tucked away in its own canyon on Butts mountain, Harbin Hot Springs (93 miles from Sacramento) was bucolic and blissful, with shimmering dry air. Stressed-looking city folk in black sunglasses unloaded European cars in the parking lot of the famously clothing-optional resort, eager to strip down and loll in the hot pools, the cold pools, or on the shady lawn; or maybe to attend an “unconditional dance” class, or a Watsu massage (a Harbin original, administered while afloat in a pool). There were painted cabins and arcaded, two-story hotel buildings, a gazebo and a swooping wooden temple, and everyone speaking quietly – whispering, even. But that was a while ago. Late last summer, after years of drought, three calamitous wildfires raced through the hilly forest and ranch lands of southern Lake County in California, two hours from San Francisco and just north of the Napa Valley. The blazes devoured 170,623 acres and 2,078 structures – including the state’s preeminent new age spiritual re-charging spot. Harbin’s dozens of buildings burned to the ground. A GRC Fieldtrip has plans to visit Harbin Hot Springs as part of a one-day trip to The Geysers from the 40th GRC Annual Meeting & GEA Geothermal Energy Expo, October 23-26, Sacramento, California. Premier Donaldson Romeo, the head of government business, is hoping for spin-offs from local geothermal energy production. He said the geothermal product would create the environment necessary for investments on the island. The Premier’s statements follow his attendance of an investment forum in the United States late last week. He gave his informed opinion that the extra electricity and bi-products of the geothermal production exercise, should attract industries and create much needed foreign exchange. Funded by the UK govt. the island is preparing for the drilling of a third well in its quest to develop geothermal energy. The current project involves the ongoing exploration and it is still within the government’s purview to find potential investors to manage the generation and sale of the energy. In 2013, two other wells were drilled and evaluations concluded that the maximum yield would be about 1.5 MW per well. It is hoped that along with the geothermal power plant, the three drilled wells will provide between 2-5 MW of electricity to Montserrat. Toshiba has won a contract to deliver a flash steam turbine system and generator for the Kizildere III geothermal power plant in Turkey. The plant will be built by Zorlu Energy in the Aydin province of West Anatolia, Turkey. Toshiba will provide the generation equipment in December this year. The 95 MW triple-flash combined cycle Kizildere III geothermal power plant is claimed to be one of the largest to be built in Europe and Middle East. The plant will integrate a 72 MW flash steam generation system that utilizes steam under high pressure with a 23 MW binary cycle power generation system using flash turbine exhaust steam to vaporize working fluid with lower boiling point and use it drive the turbine. Toshiba will deliver the flash steam turbine generator and US-based Ormat Technologies, a partner of Toshiba in other geothermal projects, will supply the binary system. The May issue of the EGEC Newsletter is now available. Drilling begins for innovative deep project in Espoo, Finland. IF technology developing ‘MiniGeo for Electricity Production in remote areas. First results available from a two-year study into the potential in Geneva, Switzerland. To access the potential energy under the surface, wells are drilled thousands of meters into the ground, penetrating reservoirs of pressurized water. Heated by the Earth’s energy, this water can be more than 300C in temperature, and when released it boils up from the well, turning partly to steam on its way. At Hellisheiði, the steam is separated from the water to power some of the plant’s seven turbines, while the remaining water is further depressurized to create more steam, used to power other turbines. At its maximum output the station can produce 303 MW of electricity, making it one of the three largest single geothermal power stations in the world. Nominations are now open. 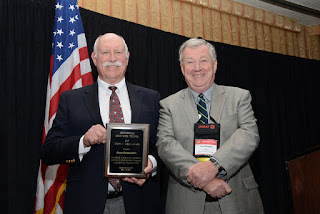 The winners will be announced at the GRC Annual Meeting in Sacramento, California, USA. The GRC has generously provided 1 page from the latest issue for free. However, the full issue is 44 pages! 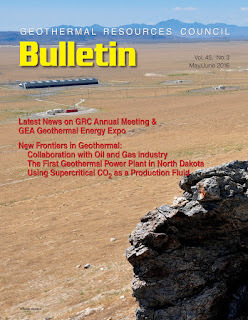 In this issue, there is a report on collaboration with the oil & gas industry, the first geothermal power plant in North Dakota and a look at using supercritical CO2 as a production fluid. 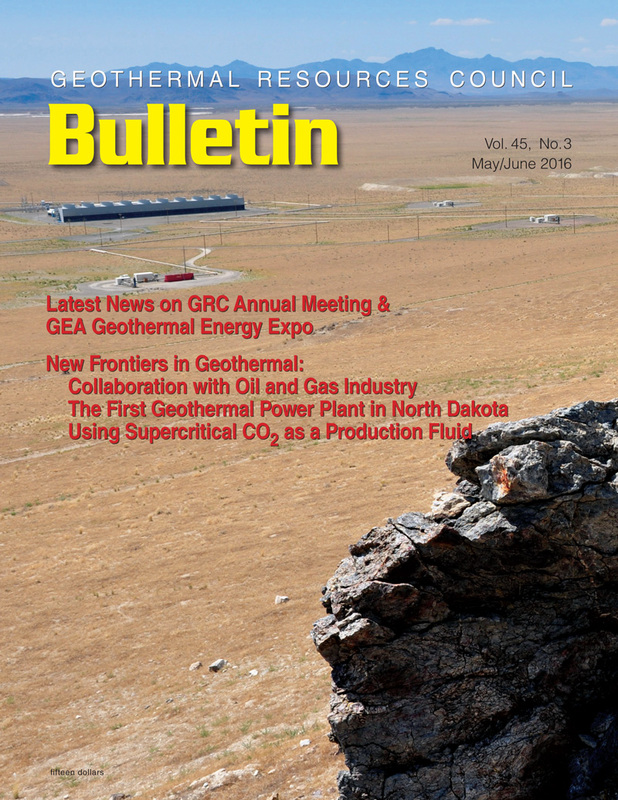 There are also updates on the 40th GRC Annual Meeting & GEA Geothermal Energy Expo and 14 pages of geothermal news from around the world. Spread the word! Download the flyer, print and distribute! The 38th New Zealand Geothermal Workshop invites you to share with your colleagues the multiple facets of innovation in the geothermal industry as well as explore the benefits and challenges faced and document the outcome. Abstracts can be submitted now and we welcome papers on all aspects of Geothermal Science, Engineering, Economics, Environment and Regulations. As an existing geothermal production field with a diverse geology amenable to both hydrothermal resources and Enhanced Geothermal Systems (EGS), Brady Hot Springs in Nevada has been a target of geothermal development for decades. Over the last six years the site has become a hotbed of activity for innovative geothermal research and development (R&D). Since 2008, the U.S. Department of Energy’s Geothermal Technologies Office (GTO) has funded a wide array of innovative geothermal R&D and demonstration projects toward the mission of accelerating and developing domestic geothermal electricity and energy, including game-changing EGS technology. Geothermal power is all around you in Iceland. It provides a bountiful source of green, renewable energy which is used to heat homes and generate electricity. But it is use for countless other things as well. Here is our list of nine ways in which geothermal energy and hot water are used in Iceland. Some might surprise you! And to provide Reykjavík with its own bathing beach! Hover over the map to see future projected energy mix. Click to launch an interactive experience showcasing the benefits of a transition to 100% clean, renewable energy. Being one of the richest countries in geothermal potential, a significant development was achieved in Turkey in geothermal electricity production and direct uses (district, greenhouse heating and thermal tourism) during last five years (2010-2015). Geothermal Law and its regulations accelerated the geothermal activities in Turkey. Especially, the feed in tariff application for electricity production and MTA’s activities boosted this sector. With the existing geothermal wells and spring discharge water, the proven geothermal heat capacity calculated by MTA is totally 5,046 MWt (leaving temperature is assumed to be 35°C). Sumitomo Forestry plans to add wind and geothermal power to its renewable energy portfolio and expand its biomass business over the next three years, bringing around five new plants online in Japan and abroad. The Tokyo-based forest manager and lumber producer plans to put around 20 billion yen ($181 million) -- more than 10% of planned investment -- into growing renewables operations in that time. It will buy a nearly 10% stake in Renova, a Japanese environmental technology startup with a track record in biomass and solar power plant development, for 1 billion yen when new shares are issued Monday. Sumitomo Forestry plans to collaborate with Renova on wind and geothermal power operations, fields both are taking steps to break into. Over the next three years, Sumitomo Forestry aims to bring a geothermal plant into commercial operation. Sites under consideration for these facilities include portions of the roughly 46,000 hectares of forestland the company owns across Japan. The geothermal plant is seen with a capacity of around 2 MW and a cost of several billion yen. Power will be sold under Japan's feed-in tariff system, wherein utilities buy electricity produced by alternative means at government-mandated prices. For the estimated 160,000 jobs in the global geothermal industry the breakdown is: USA-35,000; Japan-2,000; Germany-17,000; France-31,000; Rest of EU-55,000. This is a construction timelapse video of the construction of a 5 MW geothermal wellhead power plant by Green Energy Geothermal at Olkaria, in Kenya. 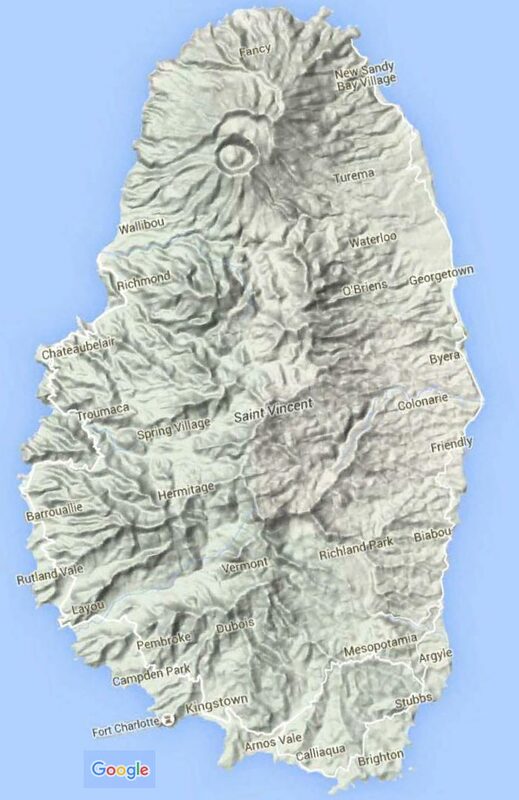 The French Government has issued an executive order that grants an exclusive exploration license for a high temperature geothermal prospect in the area of Vieux Habitants in Guadeloupe to Géothermie de Guadeloupe SaS (GdG). This licence is granted for a duration of 5 years from its date of publication. The grant of this licence marks an essential milestone of the GEOTREF project, a multidisciplinary platform for innovation and demonstration activities for the exploration and development of high geothermal energy in fractured reservoirs: the exploration results and benefits derived from all work carried out within this project, managed by GdG, are now protected as a result of this licence. It will also give GdG priority rights to access the resource once it is qualified. Geological surveys (structural and petrophysical), geophysical surveys (seismic, MT and magnetic) and geochemical surveys have already been undertaken. According to the project schedule, surface exploration work is expected to finish by the end of 2016 and conclude with an estimation of the exploitable resource, and the definition of exploration drilling targets. The Kenya Electricity Generating Company (KenGen) will now be seeking to raise Sh8.64 in its Rights Issue, after the government decided to take up 3 million shares valued at Sh20.2 billion in the issue. With the additional capital, KenGen plans to commission an additional installed capacity of about 720 MW mainly from affordable, clean and environmental friendly sources. At the moment the power generator's installed capacity is 1,618 MW. Among the projects lined up is the drilling program for 140 MW Olkaria VII, which is scheduled for delivery by 2020. The company also expects to complete 25 MW of early generation geothermal wellhead project by June 2016, bringing the total capacity on wellhead generation to 75 MW. The 140 MW Olkaria V project is expected to come on stream in 2018 and has already attracted funding from development partners, including the French Development Agency (AFD). USA, California: Hot Dogs & Burgers at the Calpine Geothermal Visitor Center! Celebrating the most prestigious and biggest geothermal annual event in the region, the Indonesian Geothermal Association invites you to be a part of The 4th Indonesia International Geothermal Convention and Exhibition (IIGCE) 2016 in conjunction with The 16th Annual Technical Meeting Indonesian Geothermal Association. 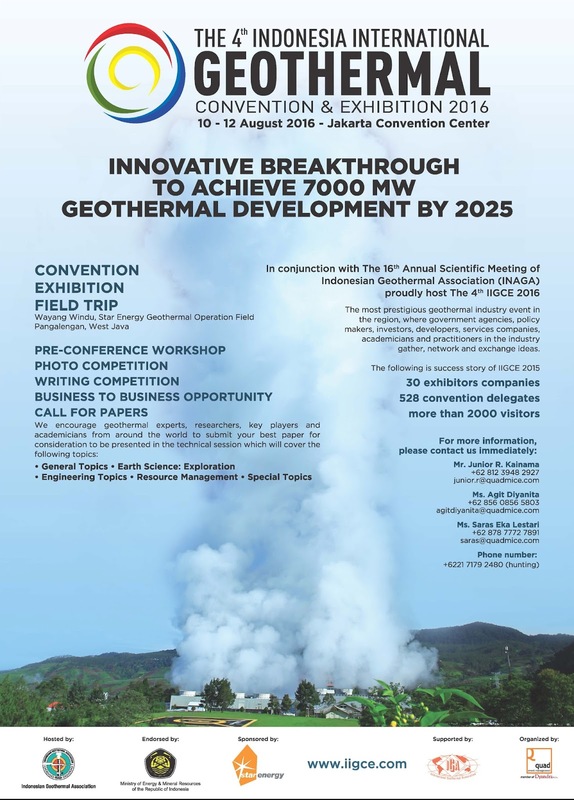 With the theme "Innovative Breakthrough to Achieve 7000 MW Geothermal Development by 2025", the event will be held on 10-12 August 2016 at Jakarta Convention Center. The Caribbean has experienced a delightful trend of late: a prominent push for geothermal energy that would benefit both the environment and general lives of people who live or vacation in the Caribbean. A fairly remote location and limited infrastructure has given the Caribbean some of the world’s most expensive energy costs, prompting a greater need than ever for new energy sources, like geothermal, which has become a major priority on islands like Nevis and St Kitts. As part of the Geothermal Capacity Building - Indonesia-Netherlands GEOCAP program we developed a small-scale geothermal power plant specifically for remote communities. We call this system MiniGeo. The goal is to provide an alternative to diesel generators which are both expensive as well as polluting. To prove the viability of the MiniGeo concept we are now working towards a first pilot project on Haruku, a small island in the Eastern part of Indonesia. This is a summary of what we are doing and why it matters. The U.S. Energy Department today announced four research and development (R&D) projects in California, Utah, Washington, and Wyoming that will receive up to $4 million in total funding to assess the occurrence of rare-earth minerals and other critical materials that may be dissolved in higher-temperature fluids associated with energy extraction. Critical materials like rare-earth elements and lithium play a vital role in many clean energy technologies, including solar panels, wind turbines, electric vehicles, and energy-efficient lighting. More of these materials—which are of high value or critical to U.S. businesses and other national interests—may become available and economically recoverable through this research. Lawrence Livermore National Laboratory (LLNL), Livermore, California—LLNL will use bioengineered microbes in the design and operation of a rare-earth enrichment and separation process to efficiently deliver high-purity products from geothermal fluids. Pacific Northwest National Laboratory (PNNL), Richmond, Washington—PNNL will demonstrate a magnetic nanofluid approach to recover rare-earth minerals and other high-value materials from geothermal fluids. University of Utah, Salt Lake City, Utah—University of Utah will perform a resource assessment of the western United States to identify high-value materials in geothermal fluids and other fluids produced from energy projects. University of Wyoming, Laramie, Wyoming—University of Wyoming will assess rare-earth element concentrations in waters produced by geothermal and oil and gas projects. The Menengai Geothermal Power plant is expected to be complete by July this year, the African Development Bank (AfDB) Group has said. According to AfDB’s Environment and Climate Manager Kurt Lonsway, the plant has a potential of producing up to 1600 MW,” Lonsway told Journalists attending the AfDB Annual Meetings on Climate Change and Energy being held in Zambia. The Grenada government says it is making significant headway in geothermal exploration on the island and thanked both the Japanese and New Zealand governments for pumping more than one million US dollars into the venture. A government statement noted that ever since signing a 2014 agreement with New Zealand aimed at facilitating the exploration and eventual use of geothermal energy, several initiatives have been completed including the undertaking of extensive geochemical, geophysics and geological surveys as well as the analysis of the institutional, legislative and regulatory frameworks for undertaking environmental and social impacts relative to developments requiring such. In in July last year, the presence of a high temperature geothermal reservoir, located north of Mt. St. Catherine was confirmed. “It was also stated that this reservoir has a potential temperature between 220-240°C or higher, which if correct, is of a capacity to generate between 15-20 MW of power,” the statement noted. As a supporting organization GRC Members pay a reduced rate of $395 for the day. The position is responsible for management, administration, and technical aspects and oversight of Yellowstone National Park's Geology Program. The position is duty stationed at park headquarters in Mammoth, WY and is within the Yellowstone Center for Resources which is responsible for science and resource management of the park. A major responsibility of the program is to implement a monitoring program that will define baseline conditions for the geothermal resources, detect changes in the system, and add to understanding of total heat flux from the park. In addition, the incumbent will collaborate with regional universities, state and federal agencies, organizations or individuals, to better understand, monitor, and mitigate the hazards associated with the active volcano beneath the park and the frequent earthquakes associated with the unique geology of the region. Kenya's power utility, KenGen, has said it is set to start the construction of the 140 MW Olkaria V geothermal power plant before the end of 2016. Managing Director of the Kenya Electricity Generating Company (KenGen), Albert Mugo, told an investors conference in Nairobi on Monday that the project, was currently in the tendering process which comes to an end in June. "We expect to sign the contract in October with the contractor so that construction can begin by the end of year," Mugo said. Japanese trading house Marubeni and Italian energy producer Enel Group have agreed to jointly develop power plants in Asia. The two companies inked a memorandum of understanding and aim to win two orders by 2018. They plan to construct and operate fossil fuel and geothermal plants primarily in Indonesia, which is launching a large-scale plan to develop resources for electricity generation, and also in countries such as Myanmar and Vietnam. The partnership will let Marubeni glean know-how on underground exploration from Enel, which is strong in the geothermal field. The Kenyan Government will limit it’s participation in the country’s geothermal development, as it seeks to open up the sector to private investors. Energy Cabinet secretary Charles Keter said that the ministry is currently constrained in funding geothermal projects that are expensive, with most projects taking more than 10 years to be developed. This, along with the dearth of qualified Kenyan geothermal technicians makes it more costly to produce electricity from geothermal sources, despite geothermal power being cheap, thus the need to open up the sector to the private sector. “We want Government participation to be limited, which will in the end open up the sector for private investors…this will only be possible if the new policy is fast-tracked,” Keter said at an ongoing geothermal consultative forum in Nairobi, citing slow pace of projects’ delivery as the reason to the change of tune. The new Energy Bill is currently before the Senate and upon its enactment Independent Power Producers are expected to be the standard model for future renewable energy development. Geothermal energy is the future of energy, especially when it comes to renewable sources, says Dragan Jurilj, the owner of Geothermal company. Together with his Turkish partner Muharrem Balet, the owner of MB Holding and Mega energy group, Jurilj is investing in the first Croatian geothermal plant in Velika Ciglena near Bjelovar. The 10 MW plant will be put into trial operation next year in May. Meanwhile, the Croatian and Turkish partners are also launching exploration activities in the area of several potential hot water springs in the north-western part of Croatia, reports Večernji List on May 21, 2016. First Philippine Holdings (FDH) Corp. declared the group, along with unit First Gen Corp., would not invest in coal-fired power plants and called for a decarbonized economy. FPH chairman and chief executive Federico Lopez made the announcement during the annual stockholders’ meeting of the company as he stressed the negative effect of emissions from coal-fired power plants in the environment. “We are setting a higher bar for ourselves but, for us, it cannot be any other way. We will help power our nation’s growth ambitions yet achieve this in ways that recognize the need for a livable Philippines and a livable planet,” Lopez said. “Today, let me state unequivocally and for the record that the FPH and its subsidiaries will not build, develop of invest in any coal-fired power plant. I’m certain that without having to look too far, this country already has many alternatives that do not mortgage the future of our children and future of our planet,” Lopez added. Instead of building coal-fired power plants, Lopez said the Lopez Group would push with the development of geothermal power plants, as well as renewable energy sources like wind, solar and hydro. Energy Development Corporation (EDC), a subsidiary of First Gen Corp. owns 12 integrated geothermal power stations in Leyte, Bicol, Southern Negros, and North Cotabato with an installed capacity of 1,169-MW. All IGA members are invited to vote for up to 30 candidates until 1 July 2016. Starting today, Friday 20 May 2016, the online voting platform for the IGA Board of Directors election is available on the IGA website. All IGA members are invited to vote for up to 30 Board candidates with their personal login details until Friday, 1 July 2016. All Board candidates including their statements are displayed online. The new IGA Board of Directors will commence their work in October 2016 and be active until October 2019. Usually, the IGA Board consists of 30 Board members representing many different countries (see current Board members list). All GRC Members are automatically members of the IGA and are therefore eligible to vote in the election. The new V3 Project elucidates the relationships between tectonics and volcanic systems and how they influence hazards on Italy's Mount Etna and Vulcano and Lipari islands. Mount Etna and the Aeolian Islands in southern Italy represent ideal natural laboratories to study how magma and tectonics interact in active volcanic zones and their associated hazards. The geodynamic context of both areas is characterized by a tectonic compression running north and south, related to the convergence of the African and Eurasian plates in the central Mediterranean (see above). This compression creates a cluster of volcanoes, some of the most active in Europe. San Francisco’s Community Choice Aggregation (CCA) program — CleanPowerSF — has arrived. First proposed in 1998, the program has been mired in conflicting agendas for almost two decades, mirroring the erratic evolution of the CCA movement as a whole over that same period of time. Now, finally, the program is online and serving 7,800 locations with a load of 40 MW. At full capacity, CleanPowerSF plans to deliver 400 MW of power to over 300,000 accounts. On the website is this information: "CleanPowerSF will buy more of your electricity from California-certified renewable sources such as solar, wind, bioenergy, geothermal, and hydroelectric. Between 35% of CleanPowerSF’s default Green energy product will come from these renewable sources, while 100% of CleanPowerSF’s SuperGreen energy product will come from these sources." "Long-term, a goal of CleanPowerSF is to invest ratepayer dollars to build new, renewable energy facilities in California and within and around San Francisco itself. This “build-out” will create local green jobs over the long-term." On May 18, 2016, the Internal Revenue Service (IRS) revised Notice 2016-31, its recent guidance on meeting the beginning of construction requirements for wind and other qualified facilities (including biomass, geothermal, landfill gas, trash, hydropower, and marine and hydrokinetic facilities). The revisions clarify that the Continuity Safe Harbor is satisfied if a taxpayer places a facility into service by the later of (1) the calendar year that is no more than four calendar years after the calendar year during which construction of the facility began, or (2) December 31, 2016. The revisions also include additional language that the Notice applies to any project for which a taxpayer claims the Section 45 production tax credit (PTC) or the Section 48 investment tax credit (ITC) that is placed in service after January 2, 2013. USA: Opinion - "Geothermal Plants are a Cost Efficient Way to Produce Electricity"
A new report from BCC Research says geothermal energy is expected to grow rapidly around the world 2015 to 2020. Globally, in 2015, geothermal energy had a total installed capacity of 12.2 GW in 2014, with a market value of 12.9 billion. North America leads the way with 41.8 per cent of the global market, or 5.1 GW, followed by Asia-Pacific with 38.5 percent and Europe with 17.5 per cent. The BCC study finds geothermal energy will grow at a compound annual growth rate from 2015 to 2020 of 10 percent, meaning the value of geothermal energy globally will reach nearly $20.8 billion in 2020. A recent study by the Institute of Political Economy (IPE) at Utah State University, “Reliability Of Renewable Energy: Geothermal,” notes the most important subsidy for geothermal energy came in the 2004 American New Jobs Creation Act, which gave geothermal energy producers a production tax credit of 2.3 cents per kilowatt hour. By comparison to other forms of energy, geothermal producers received relatively little in subsidies. Of the $13.2 billion in energy subsidies provided to energy producers in fiscal year 2013, wind power received $5.4 billion and solar power received to $5.3 billion in subsidies. Solar power was by far the largest recipient of subsidies on the basis of the amount of energy produce per dollar invested. In 2013, the geothermal industry received $345 million in government subsidies. The IPE study reports, if the subsidies are left out of the cost benefit analysis, geothermal plants are a cost efficient way to produce electricity because of its low fuel, operations and maintenance costs, and because it is physically reliable and can easily accommodate changes in electricity demand. What do you get when you combine orphaned oil and gas wells, nanotechnology, 3-D printing and a bunch of really smart geologists? Throw in a government committed to eliminating carbon-fired electricity, and you get the perfect conditions for some mind-blowing innovation in power generation. Geologists and engineers at the University of Alberta are developing something called “low temperature micro-geothermal engines.” It may be an awkward name, but what they’re working on could be an innovative breakthrough for Alberta’s power generation aspirations. The provincial government has announced intentions to eliminate all coal-fired power by 2020 – an aggressive goal that has been applauded by many. Yet the question of how we are going to get there looms large over an economy mired in recession. The state of Hawaii is taking its cue from the Philippines on geothermal energy development, hence, it has been exploring collaboration with the Lopez-run Energy Development Corporation (EDC) on such ventures. In a statement to the media, EDC disclosed that Luis P. Salaveria, a Filipino-American director of the Hawaii Department of Business, Economic Development and Tourism, was recently in the country to advance talks on the proposed collaboration. The Lopez firm noted that integrating geothermal on to the State’s energy mix has been part of its aspiration to become 100-percent renewable energy market onward to year 2045. Carbon Brief has compiled key indicators on the world’s emissions, energy and electricity. Use the links below to navigate our series of charts. A 13 May M=3.5 quake struck 30 mi (50 km) west of Death Valley at the northern tip of the Ash Hill fault. This quake is anything but an outlier: The ‘Walker Lane’ that extends between the eastern crest of the Sierra Nevada and into western Nevada was the site of the state’s third largest historical earthquake, in 1872, as well as some of the most vigorous seismic sequences in California since 1980. The Walker Lane accommodates 10-13 mm per year (0.5 in/yr) of right-lateral motion, about half of the San Andreas slip (Wesnousky, 2005), so by any measure is a major player in the Pacific-North American plate boundary. A decade of seismicity reveals the strangely symmetrical distribution of earthquake clusters located beyond the ends of the 1872 Mw~7.6 earthquake. 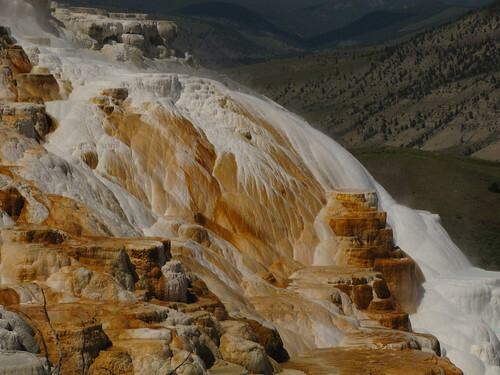 Both clusters enclose mixtures of hot springs, and extensional (‘normal’) faults and strike-slip faults, as well as sporadic eruptions in the past 12,000 or so years. Because of the hot springs, both have geothermal power plants. Several M>6 shocks struck in the 1980’s in the northern cluster, and several M~5 quakes struck in the 1990’s in the southern cluster. 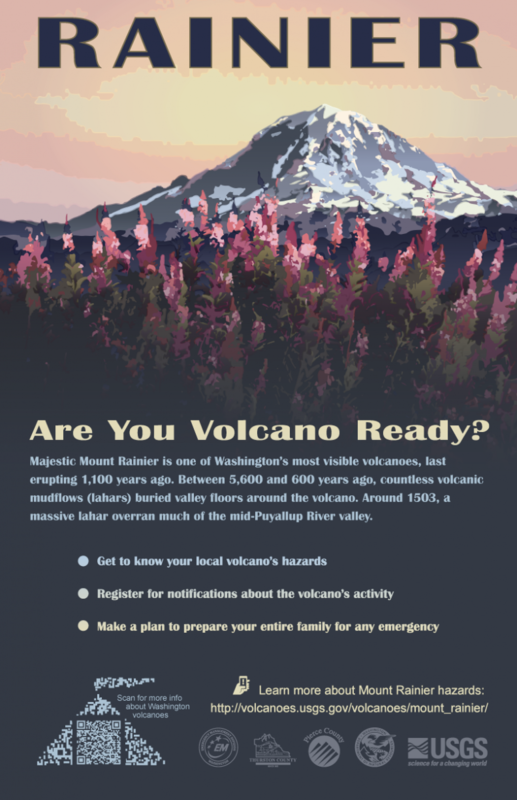 In cooperation with the U.S. Geological Survey and several Emergency Management Departments from local counties, the Washington State Geological Survey has developed a series of posters to promote awareness of the hazards posed by Washington’s five active stratovolcanoes. Kyla Grasso, Geologist with AltaRock Energy and serving on the Technical and Communications and Outreach teams for the NEWGEN FORGE project. U.S. Geothermal Inc. announced today that its wholly-owned subsidiary, Idaho USG Holdings LLC, closed on a $20 million debt facility from Prudential Capital Group. Under terms of the financing agreement, the company has the option, without obligation, to issue additional debt, up to $50 million in aggregate within the next two years. The initial $20 million loan has a fixed interest rate of 5.8% per annum. The loan principal amortizes over twenty years, with a seven-year term. Principal and interest payments are made semi-annually. The loan is collateralized with the company's ownership interest in the Neal Hot Springs and Raft River projects. The 22 MW Neal Hot Springs project is owned 60% by the company and 40% by Enbridge. The 13 MW Raft River project is owned 95% by the company and 5% by Goldman Sachs. Mexico’s Secretary of Energy (SENER) has published draft regulations for the country’s second clean electric power auction, scheduled to be held on 30 September. The guidelines dictate that winning projects under the auction must begin delivering power through their contracts with Comisión Federal de Electricidad (CFE) in 2019. Whilst final versions of the guidelines will be published in June, the basic principles of the second round will remain the same as in the first power auction, which was held in late March. Expectations are poised fairly high for the country’s second long-term power auction, which follows recent liberalization of the energy market after nationwide reforms deconstructed CFE’s monopoly and opened up the sector for private participation. The new framework so far has been extremely popular with investors; with big international players such as Enel Green Power, SunPower and Recurrent Energy winning projects and clean energy certificates (CELs) under the first auction. The government of Argentina will open the first auction for the acquisition of electricity from renewable energy. President Mauricio Macri has announced the opening of an auction for 1 GW of renewable energy capacity, which should be incorporated into energy mix by summer of 2017/2018, and with a deadline of March 21, 2018. According to the president’s schedule, the opening of the auction is scheduled for today. Provisional specifications which will be published in one month, and interested companies will have an opportunity to comment. In June, the definitive terms of the auction will be published. This will be managed by Cammesa, a public company which administers the larger Argentine electricity market. The close of offers is planned for August and completion of the auction one month later. Global Geothermal News has reported on possible geothermal energy projects in Argentina. USA, Texas: Vote for Geothermal Energy! If enough votes are gathered a talk on Geothermal: FORGE & the Next Big Get in Renewables will be part of the South-by-Southwest Eco (Eco SXSW) 2016 program October 10-12, in Austin, Texas. PanelPicker voting has been extended through the weekend. 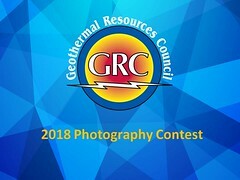 Vote for the geothermal energy program by Lauren Boyd, Enhanced Geothermal System Program Manager, U.S. Department of Energy. Your feedback is a necessary component in deciding what makes it into the SXSW Eco 2016 program. Voting will close at midnight this Sunday (May 22 at 11:59 PM CST). Sign up for a new “Basic Course in Geothermal Exploration for Regional Integration,” which is the first regional webinar on the topic of geothermal energy in the LAC region. It will be organized and conducted by the National Energy Board of El Salvador, the University of El Salvador and LaGeo, in collaboration with the Inter-American Development Bank (IDB). The course, which will be offered online, will have two editions, which will be held on July 18th and 25th, 2016 and will last for 8-9 weeks. The course has a practical and collaborative approach, with activities encouraging dialogue and the exchange of ideas and experiences among participants and course tutors. The course is open to any citizen of Latin America and the Caribbean. The cost of participation in the course (USD $3,000 per person) will be financed with resources from the IDB and the Nordic Development Fund (NDF). The deadline for applying to the course is June 3, 2016. To participate, interested candidates must submit income documentation and applications which are available on the website of the Regional Geothermal Training Program. Candidates must complete the required forms and send electronic copies of the required documents to becas@geotermia.edu.sv. St. Vincent and the Grenadines (SVG) has received a grant of GBP 4 million to support the development of geothermal energy. The grant was approved through the signing of a Memorandum of Understanding (MOU) between the Caribbean Development Bank (CDB) and the Government of the United Kingdom, through its Department for International Development (DfID). The funding, contributed by DfID, complements an additional grant of USD 9.7 million, allocated from resources provided to CDB by IDB from its Clean Technology Fund. 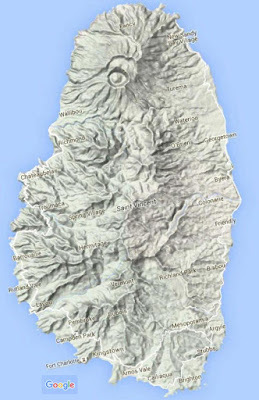 The grants will partially finance exploratory drilling in the vicinity of the La Soufrière volcano, and assess the feasibility of geothermal resource development for electricity production. Cheshire East Council, in northern England has entered a joint venture with energy and French services company ENGIE to create eco-efficient district heating networks in the area. It will build on a relationship established through ENGIE’s delivery of facilities management services to the council. Cheshire Energy Networks will focus on low and zero carbon sources of heat including geothermal energy. ENGIE will undertake all related feasibility studies, engineering and construction services as well as providing consultancy with respect to design and delivery of renewable energy projects. Ormat Technologies, Inc. today announced that one of its subsidiaries has signed a $36 million Supply, Engineering, Procurement and Construction, (EPC) contracts, with Eastland Group for the 20 MW Te Ahi O Maui geothermal project located near Kawerau, New Zealand. The construction of the project is expected to be completed in 2018. Under the Supply & EPC contracts, Ormat will provide its air-cooled Ormat Energy Converter for the Te Ahi O Maui geothermal project. This project is a partnership between Eastland Generation and the Kawerau A8D Ahu Whenua Trust, who are the owners of the land on which the project will be constructed. Eastland Generation owns the geothermal power plant GDL, which was built by Ormat in 2008. As we reported previously drilling has already begun.